Counter Yeshua's "Do not be afraid" with a list of all your fears: look deep into the stories that you have been told -- especially the stories that you have been told about yourself. Dive into the myths by which you live: all of your habits and needs: all of your fantasy searches: all of the tabled dreams. Count the many locks of your life: count each and everyone that you use: car, home, tool shed, work... but focus more intently upon what you've tossed into, and buried, in the wasteland of your heart: how many people have you placed in "lock-down"? How many times have you turned from someone reaching out to you? How many times did you forget to vote, or that you voted for someone who is just like you: a "reflector" of division, good versus bad, "us" versus "them"? How many people have you forgotten, or perhaps abandoned, along your way? "Wasteland" is a very kind word for the habitual condition of our hearts... don't you think? These exercises are important for instigating a riot of awakened possibilities. Entering the wasteland is important -- as any first step on a long journey -- but too many folks stop to built their personal shrine to that first step and so remain on the fringe of what might have been possible: no shrines for you! So you are ready for a second step? Okay, if you thought entering the wasteland was rough, wait until you unpack this: you are Nothing. You have nothing and can never truly possess even yourself! Everything that is "you" comes from and belongs to the Universe (everyone and everything) and to the Holy One (the One Reality). Your ontological poverty is perhaps the only thing you have -- and not even that really exists! Whew! Only two steps in, and this wasteland has challenged your every personal myth and busted down the notion that you "possess" anything and even are "someone"! Mercy and humility are perhaps two of the least practiced virtues: certainly the two least valued in the modern "technocratic" world that feeds on fear. All the products and all the techniques of the corporate world can never put "Humpty-You" back together again... only mercy and humility can do that particular trick. If you sustain their practice, mercy and humility will become for you enlightening teachers. In time, you will discover they have lifted and carried you all the way across and through the wasteland of your heart -- and of contemporary civilization -- into the realm of Compassion... not just the compassion of giving away free food to the hungry... but the compassion that transfigures you into every "other" and, finally, into the wholly-other: the Holy One: you will remember your secret identity: you will know with certainty "You were created by Love, for Love, to become Love". With a heart that no longer yearns for healing, preferring instead to leak out all over the place through every crack and fissure, you will no longer exist in the fantasy condition of a single human being confined by skin. You will find your skin becoming a thinning veil: an illusion of separation: and only the means to extending mercy to every Other... Compassion will liberate your desires into service. 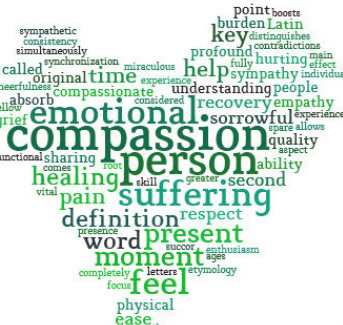 Compassion will transform your breath into an economics and politics of Love. Compassion will become for you the talisman for your transfiguration!